A year ago, a moving truck pulled up just ten miles from where my husband and I grew up. In the heat of summer, we moved boxes and unpacked: we were moving “home” to plant a church. A few months later, we invited neighbors and new friends to a huge Christmas party with food, good wine, and a hip jazz band. One of our neighbors, a bit incredulous about a church throwing a party with no strings attached, asked what our plan was to start a church. My husband floored him, saying, “I think we’re going to start by throwing good parties.” As we’ve met over small dining room tables and in local parks, hired a taco truck for a nearby neighborhood, and opened up our lives and homes, our little church has begun to grow into a generous and vulnerable community that is learning how to live out the Kingdom of God, even in the mecca of materialism in suburban, southern California. So it was with much excitement that I agreed to review Next Door As It Is in Heaven: Living Out God’s Kingdom in Your Neighborhood by Lance Ford and Brad Brisco. We all care deeply about where we are placed, and we all long for home to feel like a firm foundational place of belonging. The problem is that we elevate the nuclear family and our physical houses instead of concomitantly seeking the good of our neighborhoods, cities, and world. Authors Ford and Brisco are desperate to recover a sense of the neighborhood as the space of connection, where the gospel takes on flesh. There is a movement afoot. It has been brewing within many circles of the American church and has recently come to a tipping point that can no longer be ignored. It is due largely to a story I have heard over and over again from both local pastors and from ones across the country. Things within their church have either stalled out, radically declined, or have been discontinued altogether. The Siamese twin to these predicaments is the utter confusion, bitterness, and/or personal exhaustion found by many along this journey. Unfortunately for some, it has been too overwhelming, which results in the dismemberment of many local churches around the country. Stirrings typically begin as whispers between friends over coffee wondering what might be next. Potential solutions to these ecclesiological problems bounce around as similar stories are shared and commonalities come out from the dark. Within these conversations, authors, books, and conferences get thrown around as leaders and laity alike begin to push into the unknown future of the church. Quite a bit has changed, yet one thing seems to remain the same: our preoccupation with ideas with little to no actual action. Can We Trust Jesus to Lead His Own Church? Ten years ago I was in the middle of an identity crisis. To be more precise, it was a pastoral identity crisis. I had trained for several years to be a church planter and had moved to South Florida in 2001 to do just that. But things did not go according to plan. In fact, any plans I did have were probably not going to take shape for ten years at least. We were asking big questions: What is church? What does it mean to be a disciple of Jesus in this new century? 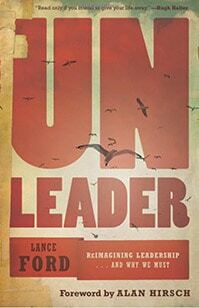 And of course, what is the true nature of Christian leadership?